Leave the mask on all night to flaunt a gorgeous gloss next day from the minute you wake up. 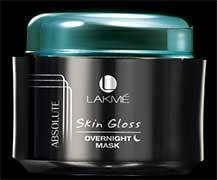 Enriched with minerals, the Lakmé Skin Gloss Overnight Mask keeps your skin hydrated and nourished. Mineral laden glacial water continuously replenishes moisture. Hydrates to make skin look lustrous. Moisture coat your skin with gloss. 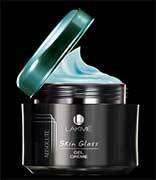 Just a few drops of Lakmé Skin Gloss Reflection Serum are enough to do the magic. Accentuate your skin’s natural shine to get a stunning glossy look and keep the moisture intact. Leave your skin feeling radiant and nourished. An aqueous veil with mineral laden glacial water. Hydrates to make skin look shiny.